The SDAAA is the focal point for service delivery to those 60 years of age and older. 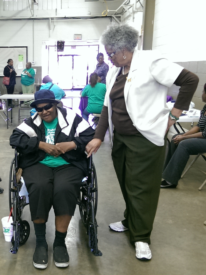 Under the auspices of South Delta planning and Development, Inc. the Area Agency on Aging is one of ten designated aging units in the state of Mississippi. It is the HUB for elderly services funded by the federal Older Americans Act, state ,and supplemental funding, in the six county area. The mission of the AAA is to foster the development of a comprehensive and coordinated service system for older persons within the planning district. South Delta AAA, in concert with the Department of Labor, provides an employment program for seniors through the Senior Community Service Employment Program (SCSEP). SCSEP is designed to provide, foster, and promote useful part- time opportunities in community service employment for low-income persons who are 55 years of age or older and, to the extent feasible, to assist and promote the transition of program enrollees to private or other unsubsidized employment. The AAA partners with a network of service providers: Bolivar County Council on Aging, North Mississippi Rural Legal Services, Sunflower – Humphreys Counties Progress Inc. Action Agency, Valley Services Inc. and Warren-Washington-Issaquena -Sharkey Community Action Agency Inc. for the provision of services.